“Setsubun” is a bean throwing festival in the beginning of February performed by family households. It literally means “seasonal division”, and its purpose is meant to purge all evil from the past year, and prevent any future evil spirits from the year to come. Now, I know what you’re thinking, ‘how does one effectively ward off an evil Japanese spirit from entering my life?’ Well, I’m glad you asked. First, you need to get your self a hand full of beans. But, not just any beans; You need 100% authentic roasted Japanese soy beans. Any other type of bean will only feed the evil spirit and make it grow stronger until the actual authentic soybeans lose their potency. I recommend the oldest, driest, most flakiest beans you can get your hands on, much like the ones served at my school lunch last week. After all, what else would you put you faith in when it comes to fending off thousands of years of Japanese demons? Once you have your beans, double check that they truly are authentic. I’ve lost some neighbors to these spirits because they unknowingly bought counterfeit beans on ebay. Next, make sure the man of the house, preferably the man whose birthday animal most closely corresponds to the current Chinese zodiac, is the one you have throwing these beans. According to Japanese folklore, it is absolutely imperative a man makes the throw. This is actually were the saying “You throw like a girl!” came from, and not from watching Johnny Damon play center field. (I do not endorse this saying, as the one of the best players on my high school baseball team was indeed a girl, who struck out MLB draft picks). No quite, “The power of Christ compels you!” But beans are still a potent weapon. Finally, have this man stand in the front doorway of your house, throw the beans outside, and yell, “Oni wa soto! Fuku wa uchi!” (Demons out. Luck in). 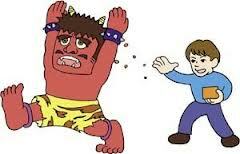 Once you have slammed the door closed and eaten one bean for each year of your life, you have successfully completed Setsubun, and protected your family from Japanese demons. Congratulations. On another note, I also attended a sea food festival last weekend. I enjoyed fresh squid, eel, and mackerel tempura. As well as a delicious fish soup. Everything was free and locally caught. It was great to see an entire community come together, as I believe food is one of the best ways to understand one’s culture. While enjoying the fresh sea food, I was interviewed by the local TV news station! I guess being the only foreigner and tallest person there made me stand out. After my two minutes of fame, I witnessed another Japanese tradition. Although it involves throwing food, there were no demons to worry about. People love their mochi here. This tradition is called, mochi maki. Mochi is Japanese rice pounded into a cake, and mochi maki is a the throwing of Japanese rice cakes. In this mochi maki, the town’s mayor and other town office members stood on the bed of a tuck and began chucking these prized cakes into the crowd. 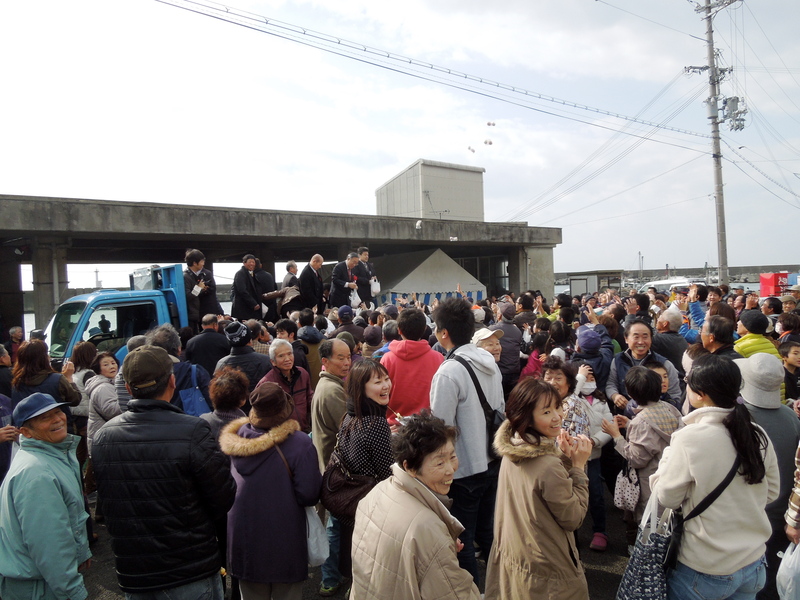 When the announcement was made that the event would start, everyone flocked towards the truck. I have never seen elderly people run so fast in my life. They loved it! Amidst the tide of elderly mochi passion engulfing me, I was able to snag a cake…sometimes it pays to have a 6+ foot wing span. I hope you enjoyed the little culture lesson. I had a blast witnessing it first hand. Below is a video taken on the way to the festival. This entry was posted in Culture, Life on Awaji and tagged Awaji, japanese demon, Japanese festival, japanese soybean, mochi maki, setsuban, tempura. Bookmark the permalink. By far the most entertaining description of Setsubun that I’ve encountered! Great video as well. Thanks, Ann. I’m glad you enjoyed!